The main difference between the PVB-1 and the PVB-3 is the contrast in the cavities. Please refer to product specifications below for further detail. The PVB series of Interventional Arterial Phantoms are constructed of a tissue mimicking rubber-based material. The phantoms are housed in a chemical resistant, injection molded polypropylene shell to permit sterilization be means of autoclaving. Model PVB-1 contains five cylindrical cavities. A 4 mm diameter cavity is located in the center of the phantom and four 2 mm cavities are positioned at 90º intervals around the central cavity. The edge to edge spacing of the four cavities relative to the central cavity are 1, 2, 3, and 4 mm. Model PVB-3 contains five cylindrical cavities. A 4.0 mm diameter cavity is located in the center of the phantom and four 2 mm gray scale targets ranging from +15 to -15 dB relative to the background material are located at 90° intervals around the central cavity. the edge to edge spacing of the four 2 mm cavities relative to the central cavity is 4 mm. 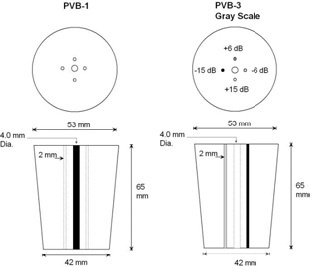 The PVB is designed to evaluate the acoustical performance of an intra-arterial ultrasonic transducer prior to performing an examination of the patient. For best results the phantom should be kept clean at all times. In particular a build-up of dried coupling gel on the scan surface should be avoided. The phantom may be cleaned with warm water using a lint free cloth. Stubborn stains and dirt may be removed with a mild household cleaner. The use of petroleum solvents should be avoided since they may adversely react with the rubber-based material.